Authorization letter for the lender to speak with a real estate agent, attorney, or other third party. Estimated Net Sheet; an estimate of what the lender can expect to receive from the sale after the expenses. Appraisal of the Property (also known as the Broker Price Opinion – BPO). Hardship Letter indicating why the owner cannot make the payments. Supporting documents such as medical bills, bank statements, pay stubs, etc., should be included. Estimate of any repairs that may be needed. Asset and liability worksheet should be filled out to determine financial inability to re-pay. A Contract of Sale executed by the Purchaser. Payoffs of other loans, liens or other mortgages on the premises. Any other information that the lender is requesting. When submitting documents to the lender it is imperative that you submit all documentation in a prompt fashion, as a delay in submitting documents can lead to the lender not approving the short sale. 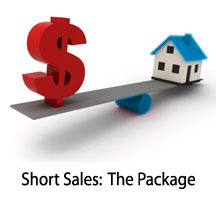 To assist both my clients and real estate agents who are working with short sale transactions, I have created a guide providing beneficial information about short sales, in depth explanation of documentation required, and sample documents. If you are interested in receiving a copy of this guide, please visit my website and request a copy to be sent to you today!